Collared Dove (Streptopelia decaocto. Taken at Abingdon, Oxon., on May 22nd 2013. Taken at Abingdon, Oxon., on May 22nd 2013. 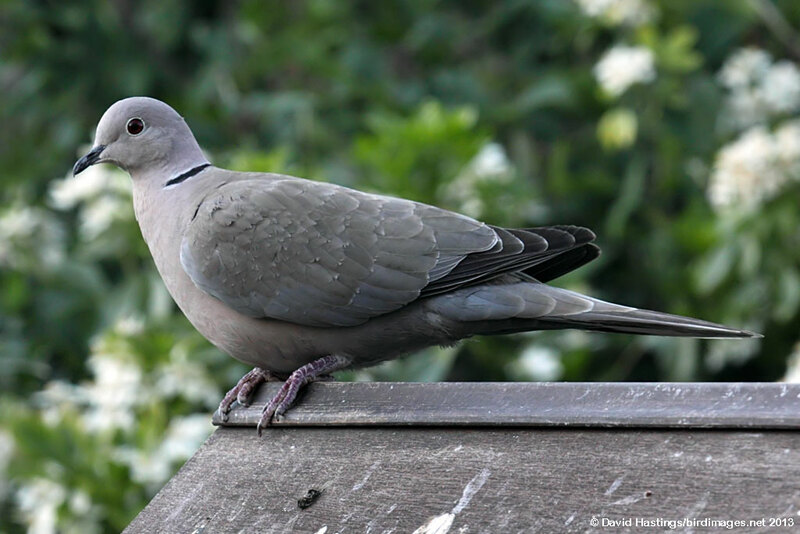 The Collared Dove is a small buff-grey bird, with a darker back and a blue-grey wing patch. The tail feathers are tipped white. It has a black half-collar on its nape from which it gets its name. The short legs are red and the bill is black. The iris is reddish brown, but from a distance the eyes appear to be black, as the pupil is relatively large and only a narrow rim of reddish-brown eye colour can be seen around the black pupil. The sexes are similar. Collared Doves can be found almost anywhere in the British Isles. They breed where there are dense trees for nesting. These can be around farmyards and in parks and gardens. Collared Doves are usually seen singly or in pairs, although flocks may form where food is plentiful. They feed on the ground but readily perch on roofs and wires. After rapidly spreading across Europe in the early half of the 20th century, the Collared Dove is now one of the commonest British birds, with around 300000 breeding pairs.